We were recently consulted on medical work-up of a young, previously highly functioning patient who presented with new onset auditory hallucinations and disheveled appearance. My first response was "test for anti-NMDA!.. have you guys read Brain on Fire?? You HAVE to read Brain on Fire!!" I can't do the book justice, so I'm just going to copy and paste the insert. A gripping memoir and medical suspense story about a young New York Post reporter’s struggle with a rare and terrifying disease, opening a new window into the fascinating world of brain science. One day in 2009, twenty-four-year-old Susannah Cahalan woke up alone in a strange hospital room, strapped to her bed, under guard, and unable to move or speak. A wristband marked her as a “flight risk,” and her medical records—chronicling a month-long hospital stay of which she had no memory at all—showed hallucinations, violence, and dangerous instability. Only weeks earlier, Susannah had been on the threshold of a new, adult life: a healthy, ambitious college grad a few months into her first serious relationship and a promising career as a cub reporter at a major New York newspaper. Who was the stranger who had taken over her body? What was happening to her mind? In this swift and breathtaking narrative, Susannah tells the astonishing true story of her inexplicable descent into madness and the brilliant, lifesaving diagnosis that nearly didn’t happen. A team of doctors would spend a month—and more than a million dollars—trying desperately to pin down a medical explanation for what had gone wrong. Meanwhile, as the days passed and her family, boyfriend, and friends helplessly stood watch by her bed, she began to move inexorably through psychosis into catatonia and, ultimately, toward death. Yet even as this period nearly tore her family apart, it offered an extraordinary testament to their faith in Susannah and their refusal to let her go. Then, at the last minute, celebrated neurologist Souhel Najjar joined her team and, with the help of a lucky, ingenious test, saved her life. He recognized the symptoms of a newly discovered autoimmune disorder in which the body attacks the brain, a disease now thought to be tied to both schizophrenia and autism, and perhaps the root of “demonic possessions” throughout history. 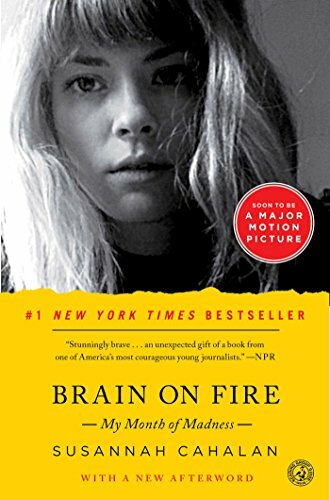 Far more than simply a riveting read and a crackling medical mystery, Brain on Fire is the powerful account of one woman’s struggle to recapture her identity and to rediscover herself among the fragments left behind. Using all her considerable journalistic skills, and building from hospital records and surveillance video, interviews with family and friends, and excerpts from the deeply moving journal her father kept during her illness, Susannah pieces together the story of her “lost month” to write an unforgettable memoir about memory and identity, faith and love. It is an important, profoundly compelling tale of survival and perseverance that is destined to become a classic. BTW - you can download a kindle app onto your ipad. It's usually cheaper than ibooks. I myself have become a big fan of audiobooks. They can be expensive, so right now I'm using an audible subscription. The first month is free and then it's $14.95/month for one audiobook and additional audiobooks are sold at a discounted price. I listen to audiobooks when i'm cleaning and when I'm driving to and from Atlanta. The only down sided is I've become really behind on This American Life. The 3 items I I take on every run with me. When you mindlessly agree to do ridiculous things..